Last I checked, this wasn't available on DVD, but was available in downloadable torrent form at Animez.info. The above info came from Kefka989, and was edited by yours truly (contact me). The image came from Anime News Network. Romance of the Three Kingdoms is a historical drama based on the historical event in China, as based on a historical record by the Chinese writer Lo Kuan-Chung. The year is 184 AD, and the current Chinese dynasty is on the brink of oblivion. A roving army several hundred thousands strong comprised of peasants, labeled the Yellow Turbans due to their yellow scarves, ravages the land like a plague. It's at this time that three heros emerge. The Heros are Liu Bei, a distant relative of the current Han dynasty, Guan Yu, a strong man with a long flowing beard, and Zhang Fei, a drunkard who is said to be worth 10,000 men on the battle field. 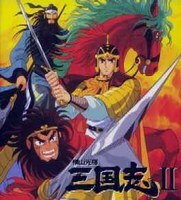 The story follows these heros as they fight against the ever growing Yellow Turbans, the tyrannical Dong Zhuo, the unstoppable Lu Bu, and the other hero's all fighting to control China. This anime was created by Mitsuteru Yokoyama, and is based on a manga of the same name that was Yokoyama's life work. Yokoyama is also known for his early black-and-white work, Gigantor. This anime has yet to be translated into English, and at this point, there are no plans to ever bring it to the states. Side notes: There are no copies of this anime available (to my knowledge), and only one episode (#1) is available for viewing on the net. The story and characters are also featured in Koei's video game lines; Romance of the Three Kingdoms, Dynasty Warriors, and Dynasty Tactics.